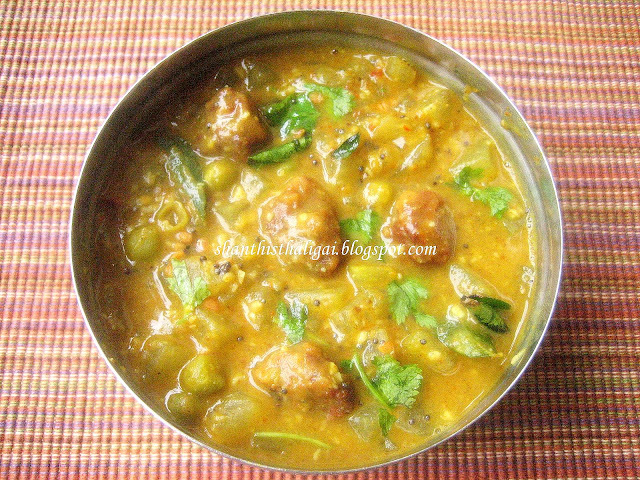 This is another tasty kootu made on Iyengar marriages and festivals. Ash gourd (Pooshanikkai) - 1/2 kg. Soak peas overnight and pressure cook. Pressure cook toor dhal with turmeric powder , mash and keep aside. Soak tamarind in water and squeeze out the pulp. Wash and chop ash gourd into small pieces. Heat oil in a kadai. Fry & powder coarsely the items given in "To fry in oil and powder". Keep aside. In the same kadai, heat a tablespoon of oil and fry the kozhambu vadaam till golden brown. Keep aside. Cook ash gourd in water with salt, hing and turmeric powder. When half done, add the fried kozhambu vadaam, peas, & tamarind water. When cooked, add the mashed dhal. Let it boil till thick. Finally add the coarsely ground powder and give it a boil. Season with the items "To season". This tastes great when mixed with rice + little ghee. Can also be had as a side dish for southindian meals. Wat a tempting kootu, that too with kozhamby vadaam, looks delicious.. I am not big fan of thalippu vadam,but this kootu sounds yummy! I love anything pulippu and this curry with pooshnikai sounds awesome. Hope to try it soon. Is it okay to make this without the vadaam? with "mochcha kottai" (baby beans) in place of dried peas it tastes much to my liking...worth a try shanthi...thanks.